Think local as you start your holiday shopping. Shopping in Athens County keeps money in Athens County. For every $100 spent locally, $48 remains in our community. That’s why supporting the businesses that support you is so important! 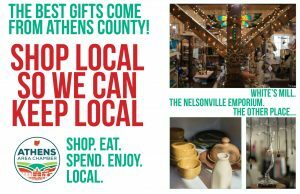 Get creative this holiday season – Athens has many robust locally-owned independent businesses selling products from handmade crafts and agricultural products to books, custom shirts, and home decor. Check out www.athenschamber.com for a complete list of Chamber Members.